NECA has postedthefirst photo and info for a new Extreme Head Knocker. The new EHC is based on Rorschach from the live action Watchmen film. It’s one of the most memorable faces in comic-cinema history, which it’s funny, since it’s never the same twice. NECA is psyched to reveal our newest Extreme Head Knocker: Rorschach! Rorschach is the first ever Watchmen Head Knocker based on the hit movie adaptation of the classic graphic novel! 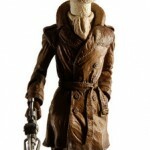 Posed on a Doomsday clock base, Rorschach stands over 7″ tall and is highly detailed and movie accurate. So if you’ve ever found yourself disgusted at the moral decay of today’s urban environs, don’t resort to vigilantism, just take a look at Rorschach over there on your shelf and know he’s out there to avenge all of our lost innocence. You’re way less likely to break an ankle that way than you are jumping off a rooftop. Our Extreme Head Knocker Rorschach is in stores now.